A decadent cake made a little healthier with the addition of oatmeal. A treat every chocolate lover will love! The coconut flakes give a tropical twist while the nuts add some crunch. 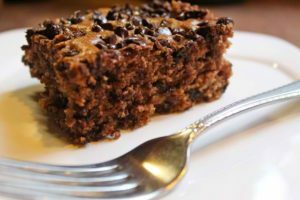 This Chocolate Oatmeal Cake is very easy to prepare and is ready in under an hour. Here is an easy dessert recipe for Chocolate Oatmeal Cake. Preheat oven to 350 degrees F and lightly grease a 9x13" pan. Set aside. Mix together oatmeal, butter and chocolate chips in a large bowl. Pour boiling water over mixture and let stand for 5 minutes. Add the cocoa and mix well with a wire whisk until butter and chocolate chips are melted and fully incorporated. Add 3/4 cup sugar and 1 cup brown sugar and whisk to combine. Set aside for another 10 minutes. Beat eggs and vanilla extract into the cooled mixture until combined. Add flour, baking soda, and salt and whisk until well blended. Immediately pour batter into prepared pan. Bake for 25-35 minutes until cake pulls away from sides of pan and springs back when lightly touched in center. Remove from oven and set aside. Turn oven settings to broil while making the topping: combine melted butter, walnuts, sugars, coconut, cream, and vanilla extract in a medium bowl and mix well. Drop spoonfuls of topping mixture onto the cake and spread to cover entire top. Place under broiler, about 4 inches from heat source, and broil for 2-5 minutes until topping is bubbly and light golden brown. Keep a close watch and turn the cake if necessary to cook the topping evenly. Remove the cake from oven when the topping starts to bubble profusely. Sprinkle the chocolate chips on top and let stand for 10 minutes. You can leave it as is or you can run a knife or a skewer over the melted chocolate and warm topping to create swirls. Cool and cut into squares.